ept connectors are internationally used in high standard applications like instrumentation, medical and industrial engineering, automotive and transportation, military and aerospace, telecom and datacom. 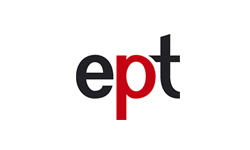 With its range of connectors and processing technology, ept offers comprehensive all-in-one solutions from a single source. Decades of experience ensure technical competence and an extremely high quality standard, combined with creativity and precision, when it comes to your individual product and machine solution.